I received an email from Cassandra today over at Altered For Him. 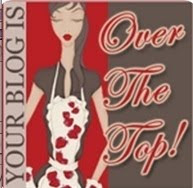 She gave me an over the top blogger award! I am so happy. Thank you Cassandra, it is much appreciated! Don't forget to visit her blog and see her great works! If you have visited my blog and made it all the way down to reading this sentence, then this blogger award is for you too! Grab it for you and pass it on! Monica, you are just too sweet! Thank you so much! Blessings to you! THANKS FOR THIS SWEET AWARD!! NOW I NEED TO ANSWER ALL THESE? - LOL!! HUGS !! Thank you so very much!!!!! You are awesome!